A relieved England head coach Brian Ashton wanted the spotlight put on his entire team rather than just new star Danny Cipriani tonight. On his first start for his country stand-off Cipriani, axed last week over a nightclub visit, landed four penalties and three conversions in the 33-10 victory over Ireland at Twickenham. He did not miss one kick at goal. But Ashton, whose position had been under threat following the defeats to Wales and Scotland, said: "That was a team performance, not a one-man band - and one of the best team performances I've seen in a long time. Danny did really well, though. You're not sure until they come out whether players can bring Premiership form into internationals, but for most of the game he did. "He will be very pleased - and we are reasonably pleased as well! - but the guys around him helped enormously, so let's not go overboard." Cipriani replaced Jonny Wilkinson, who came on in the second half not for the 20-year-old but for Toby Flood in the centre. Asked about what happens now for the England stand-off position, Ashton replied: "It will be a royal battle now. There are a number of good number 10s knocking around - and Jonny did well in the centre while he was out there. "For the first seven minutes, we didn't feel we had worked Ireland out. We had a fairly short week in training - but we were fairly specific on what he worked on. We thought we could pose them problems and for most of the game we did, with the ball and without the ball." On the subject of the championship - three wins and those two defeats - Ashton added, "It was a missed opportunity - big time". But when it was put to him that the weight must now be lifted from his shoulders he was quick to respond: "You must be joking. Winning one game does not mean any less pressure. The pressure just comes with the job. You can't hide away - the press is there every single game. But this solidifies one or two selections, and it was a nice way to finish the tournament. "We haven't got the players for about two months now. I hope they go back to their clubs, play really well and - most important of all - stay injury-free." England tour New Zealand in the summer. "We put into operation all the things we said we were going to, and that's the first time in the tournament we've managed that," he added. 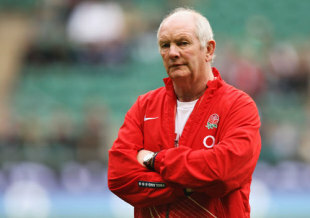 "Our performance was a massive improvement on anything else we have done in the Six Nations. It looks as though the players need a defeat to get them going. That's the biggest thing we have got to turn round." Wilkinson was the only man dropped after Murrayfield, and Ashton said, "Jonny handled it in a very professional manner. We go away and reflect now. Of course I have sympathy for Eddie [under-fire Irish coach Eddie O'Sullivan]. I have massive respect for every international coach and don't like it when they are getting stick." Eddie O'Sullivan tonight vowed to fight on as Ireland coach despite presiding over a torrid season that slumped to a new low with the 33-10 RBS 6 Nations defeat by England. Ireland endured an abysmal exit from the group stages of the World Cup last autumn, have slumped to eighth place in the world rankings and today concluded their worst Six Nations Championship since 1999. Calls for O'Sullivan's dismissal have intensified in response to the team's decline but the 49-year-old refused to step down. He said, "My own position is that at this moment in time I'm not making any decisions about anything. What we always do after every major tournament is meet with the Irish Rugby Football Union to discuss the bigger picture and that will happen again. "After that I suppose we'll know what we're doing going forward but until then there's not much point in doing anything. Absolutely I believe I am the right man to lead Irish rugby. I think the big question for me is have I got the hunger for this job and the answer to that is absolutely, 100%. "I love this job and I've always given it 110%. If I thought I couldn't give 110% I'd be the first to admit that. But I love this job and I intend to give it everything I have as long as I'm doing it." Ireland were condemned to a fourth-place finish in the Six Nations table after today's mauling by an impressive England and O'Sullivan insisted he had no regrets over the way he approached the tournament. He said: "It's been a disappointing championship for us. We wanted to hit the ground running and have a big tournament but unfortunately we spluttered instead of playing. We didn't have a good start against Italy, our performance against France was excellent and we were unlucky to lose our game. "We had a good performance against Scotland and then suffered a setback against Wales. Today we tried to pick it up again but it didn't happen and to be fair to England they played well and took their opportunities. "It's been a disappointing Six Nations because in the recent past we've always managed to win more than we lose but that's been turned around this year as we've lost more than we've won. I wouldn't do anything differently, we took each game on its merit and tried to win them all. "If I could change results I would but I don't think you could say that we went out and did anything foolish. We gave it our best shot in every game, in some games it happened for us, some games it didn't." Ireland raced into a 10-0 lead when Rob Kearney crossed with only four minutes on the clock with Ronan O'Gara landing the conversion and a penalty, but the visitors could not sustain that early momentum. O'Sullivan said: "On the day the better team won, the final score was a reasonable reflection of their dominance. I'd say the area that really worked in their favour was the midfield. Their midfield worked well together as a unit. They caused us problems in that area and we didn't do the same to them. "The midfield is the one area where we've been having a few problems with injuries and have had to shuffle guys around. We didn't have the cohesion that England had in that area. That was the difference between the teams, they were able to do more damage with the ball."